Oohh! Aahh! Don't you just love fireworks?! 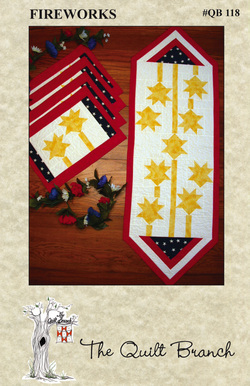 Now you can bring them to the table for any patriotic celebration with this easily pieced design. Featuring gold stars on a white background with red & blue borders, this Fireworks table runner (17" x 51") & placemats (12½" x 17") can only add to the party. Celebrate your patriotism with this Fireworks pattern.